A policy is in place at the Ministry of Women and Children’s Affairs to allocate 25 per cent of the budget for economic development in rural areas. According to vision 2025, the government hopes to increase the number of exporters especially the Small and Medium enterprises that is of vital importance to the socio-economic development of the country as it contributes to generate employment, income and poverty alleviation, said the Minister of Women and Children’s Affairs, Chandrani Bandara. 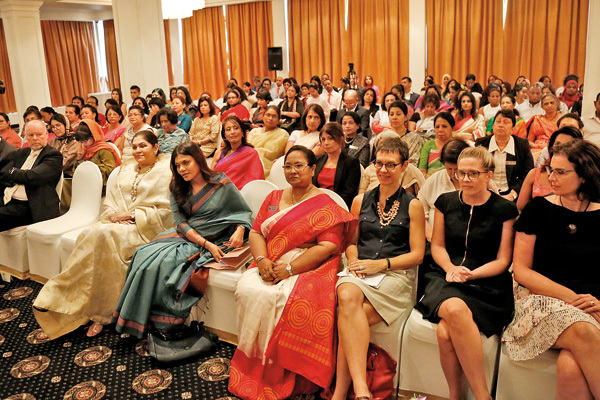 She was speaking at a function last week held at the Kingsbury Hotel Colombo by the Women’s Chamber of Industry and Commerce (WCIC) to commemorate International Women’s day. She said that women in entrepreneurship is now gaining ground in Sri Lanka although it was a male dominated vocation previously. Today there are many women who are running their respective businesses as outstanding entrepreneurs owing to economic development and globalisation. She said that despite women doing well in the education field there is a big gap when they enter the labour force. On the other hand women leave their respective jobs for various reasons mainly to look after the families. “These women could be encouraged to be entrepreneurs supplementing their family income. We solicit support from the Women’s Chamber of Industry to encourage women entrepreneurs,” she said. Meanwhile, a majority of the women in the informal sector are involved in small scale employment activities contributing to the economic development of the country although their contribution has not being quantified. The Ministry of Women and Children’s Affairs has been working towards developing entrepreneurship skills of rural women by providing credit, on easy terms, developing and providing marketing facilities. The Ministry of Vocational Training had taken up several measures to encourage girls to enroll in non- traditional vocation and data shows that in 2018, 32 percent of those enrolled are women. Keynote speaker, Hans Timmer, Chief Economist South Asia Region of the World Bank, said that they strongly support the initiative of giving women an equal opportunity to encourage entrepreneurship. The World Bank works closely with governments and the civil society and partners like the Australian government. It is about basic fairness of equality of opportunity giving women access to jobs and getting women to start a company. At the macro- economic level it is an opportunity to increase the participation level of women in entrepreneurship to produce better goods. Studies show that companies led by women have become more sustainable. He said the South Asian region has still a long way to go. Chairperson –WCIC Chathuri Ranasinghe said that the chamber is a premier body that supports women entrepreneurs and professionals who are celebrating the women’s knowledge forum. Women’s International day showcases the achievement of women the world over for their contribution to the country’s economy and for providing an equal opportunity for women.